school teacher wife' after she found out about their affair. 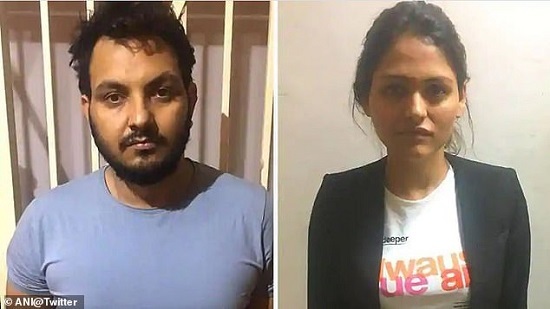 Half-British actress and model Angel Gupta was arrested together with lover - named only as Manjeet - and her father Rajeev, who had helped them in the conspiracy. The wife, Sunita, who has a 16-year-old daughter and eight-year-old son, was shot dead in broad daylight three days before the arrests after she found out about the affair between Gupta, also known as Shashi Prabha, and Manjeet. Sunita, 37, was was shot three times on Monday morning in the Bawana area of Delhi while she was on the way to her school. Her body was found by a passer-by as it lay next to her scooter. She was declared dead on arrival at a local hospital. The police dismissed a theory that it was a robbery gone wrong because nothing of her possessions, including cash and mobile phone, had been stolen. The Hindustan Times reported that Sunita’s family members alerted the police to their fears that the husband could have been involved in the murder, saying they knew about Manjeet’s affair with Angel, a Bollywood actress.